You demanded, and we listened! Since it burst upon the scene four years ago, GURPS Dungeon Fantasy has been wildly popular in escorting adventurers back to its questing, killing, and looting roots. We've had supplements detailing monsters, supernatural allies, clerics, artifacts, and more. However, despite all these goodies, we've never released a full-fledged adventure. 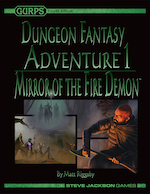 GURPS Dungeon Fantasy Adventure 1: Mirror of the Fire Demon is a meaty mission for Dungeon Fantasy that will take heroes on a quest to track down an artifact of power (which may be cleverly hidden in the adventure's title). They need to hurry -- not just because the forces of darkness are gathering (although they are), but also because other adventurers are trying to track it down as well. And there's no telling what they'd do with the treasure that's rightfully yours to steal! Written by Matt Riggsby (author of GURPS Dungeon Fantasy 8: Treasure Tables and GURPS Dungeon Fantasy 13: Loadouts), this tale comes complete with the maps, mooks, and monsters you need to make it epic. Even better, it's been designed not only to be used, but reused. Random wilderness maps, various "henchthings," a dozen ready-to-use adventurers, and a bunch of new monsters means that you'll be able to keep running your own Mirror of the Fire Demon even after the heroes have emerged triumphant. The fans have been demanding an adventure since GURPS Dungeon Fantasy began, and we've done everything in our power to help ensure that GURPS Dungeon Fantasy Adventure 1: Mirror of the Fire Demon is worth the wait . . . and hopefully the demand for this one will be so overwhelming that we'll be inspired in our quest to do more!